VISTA, CA (April 28, 2016) — Haunted by recurring nightmares and a traumatic childhood, art student Chloe Moray manifests her inner turmoil through some dark artwork. But she cannot identify exactly where the disturbing images come from, and begins to suspect that they relate to suppressed memories — memories that seem to link to the unresolved death of a teen girl some twelve years prior. But everyone thinks that Chloe, played by Nathalia Ramos (Nickelodeon’s House of Anubis, ABC Family’s Switched at Birth), is simply delusional with serious mental issues. Everyone but Josh that is. He thinks there may be something more behind the visions. 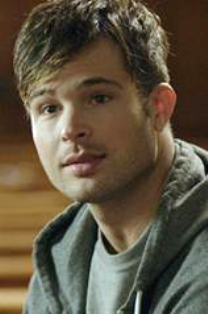 Josh, played by Cody Longo (High School, Fame, Not Today, Hollywood Heights…), shrouded by his own sad memories from a personal tragedy, and struggling not to lose his faith, finds himself wanting to help Chloe. In so doing, he finds himself risking his life looking for a killer. Josh’s compassion for Chloe — his desire to walk with her through this tense drama — lead them both of towards healing. 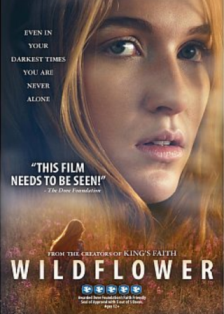 Wildflower brings a strong message of healing and restoration. It is suspenseful with many unexpected twists that keep you guarded till the end. However, the movie overlooks a few issues that bothered me. For one thing, Chloe, who has run away from home and is in hiding, has a different set of clothes in every scene. (I don’t see how all those outfits could possibly fit in her backpack.) 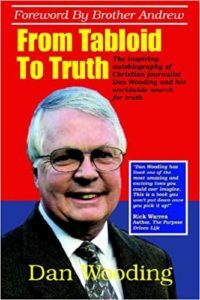 There are a few other places where the details of the story seem to have been overlooked making it less credible, but overall the film is good. Written and directed by Nicholas “Nick” DiBella, a prolific and successful screenplay writer (Runnin’ Home, Address Unknown, Chasing Bobby Jones, Kart Racer), this inspiring psychological thriller is being released worldwide this Spring. Find more about Wildflower at http://www.wildflowerthemovie.com/, or on Facebook at https://www.facebook.com/Wildflowerthemovie/. Photo captions: 1) Scene from the movie. 2) DVD Poster. 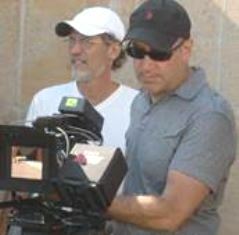 3) Nick DiBella, director, behind the camera. 4) Cody Longo. 5) Louis and Janey DeMeo, pictured at the studios of the Holy Spirit Broadcasting Network (http://hsbn.tv), after doing an interview there. About the writer: Janey DeMeo is founding-president of Orphans First — a Christ-centered non-profit ministry helping underprivileged children around the world. She is an author, freelance writer and Bible teacher — and has worked with husband, Louis, as a church-planter in France. Her website is: www.orphansfirst.org. ** You may republish this or any of our ANS stories with attribution to the ASSIST News Service (www.assistnews.net). Janey DeMeo is founding director of Orphans First, a non-profit organization providing food, clothes, shelter, education, medical help and Bible teaching for suffering children in several countries: www.orphansfirst.org. Janey is also an author and writer with books and articles in French and English. Janey and her husband ministered in France for 22 years and planted a church. They traveled extensively to many other countries for the cause of Christ, helping church-plant initiatives and launching children’s ministries. They finally moved to America at the end of 2003 and both taught in the Calvary Chapel Bible College for a few years. Their present ministry focuses on discipleship and helping children-in-crisis. Janey’s parenting book, Heaven Help Me Raise These Children! provides biblical responses to practical parenting issues is now out-of-print but still exists in its French version, Mon Dieu, ces enfants! (http://www.vida-editions.com/famille/98-mon-dieu-ces-enfants--9782911069109.html). Janey, a Brit, describes herself as a mother, grandmother, animal lover and advocate for children-in-crisis and issues of justice. Her husband is a pastor.